Did I make this title banner in paint 5 seconds before I published this? Maybe I did. From Stage 4 Champions to 0–7. From Map 5 against NYXL to a 2–1 loss to the Outlaws 2 weeks later. From “not passing the eye test” to not passing… any test. The Valiant have been a bit of a conundrum for a lot of people this season. The team, which had been predicted to be mid-tier at worst, and a top contender at best, is somehow the only winless team in the League. Why exactly are they struggling in Season 2? As a Valiant fan (it’s been a rough 4 weeks for me), it’s a question that keeps me up at night. Is it Kuki’s Lucio? Agilities’ Brig? Kariv’s 0-man gravs? Fate charging in with no support and dying instantly? Curious and upset, I directed my desperation toward looking through the Valiant’s stats, and came up with a few theories about the Valiant’s predicament. Since these are mostly generalized theories based on stats and less about deep analysis of individual plays in a game, you may find anecdotal evidence that contradicts these theories. I don’t claim to have authority over anything, so I’d love to get into a discussion about these and maybe work through my new Valiant-based nightmares. 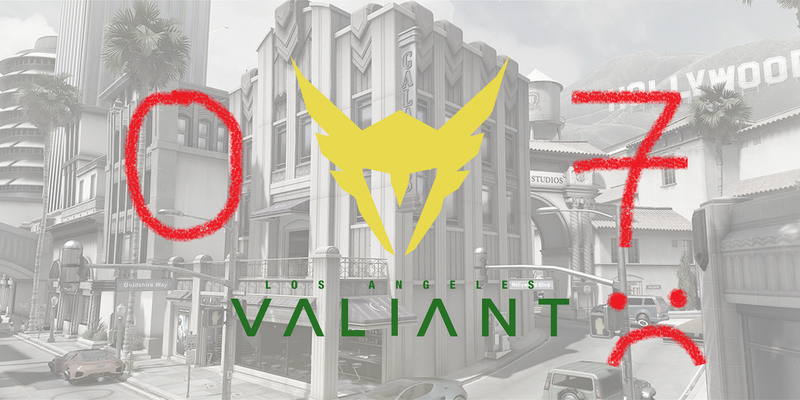 I also want to acknowledge that Valiant played the 1st, 2nd, 3rd and 4th team in the current standings this stage, and while their strength of schedule was hard, there are still mistakes that they made that cost them multiple games, and that’s what I’m here to talk about. Now before we begin, I do have to note that on the surface, the Valiant’s stats don’t look bad. Most of the players are pretty average (at times even above average) when it comes to typical healing, damage, and eliminations per 10 minutes numbers. The explanation is also pretty straightforward — most of Valiant’s loses were pretty close games (I didn’t forget about the Titans, I said most! ), so their stats won’t tell a scathing tale like say… the Justice’s stats might. Rally to… Agilities’ Brig Play? It may be shocking to realize that among Brigitte players (with over one hour clocked in the season so far), Agilities ranks #1 in time taken to charge ultimate. With an average time of 78.55s (that’s 10 seconds faster than the league average of 88.6), Agilities clearly leads the pack. In fact, by almost all counts, Agilities’ Brigitte stats look… great? He has one of the highest healing/10 mins and damage/10 mins among Brigitte players in the league. He beats out some of the top teams’ Brigittes in both stats. Which makes sense, since damage and healing is how you get ult charge. Agilities is putting out both in spades and building rally faster than anybody else. But what we should recognize is that no matter how fast you charge your ultimate, it’s all about using that ultimate to win the fight. And that stat is represented by the percentage of fights won when the player uses their ultimate. The league average for this statistic is around 56%, meaning when a Brigitte uses ultimate, their team wins the fight 56% of the time. Now let’s look at the percentage of fights won when the Brig player uses Ult. Agilities sits at 49%, pretty obviously below league average. Against certain players who are boasting over 75% win rates with Rally (like Rascal and Guard), it seems like a pretty weak stat line. Despite charging Rally a whole 10 seconds faster than a player like Guard, Agilities is not using this ultimate to turn the fight like you would hope, and his Rally use is not translating to fight wins. I don’t want to get too much into anecdotes in this piece, but it does bring up a situation like the Guangzhou game, where Agilities would pop rally to start a fight, Guangzhou would just disengage, and then come back in with Kyb’s own rally as Agilities’ Ultimate was fading. This essentially leads to a Rally with 0 value, because of the poor timing of its usage. Situations like this are, in my opinion, pulling down Agilities’ stat line. Don’t be an Ado… Or maybe do, if you’re Mayhem (rip). Another side note that is more of a theory than a hard fact, but may explain how Agilities is beating people out in both damage in healing. Brigitte’s passive “Inspire” triggers healing when she deals damage. Agilities’ may be pumping out huge healing numbers BECAUSE of his huge damage numbers, so his healing numbers are somehow more reflective of aggression rather than defensiveness. (I need stats on Inspire uptime for this, which the OWL website doesn’t provide, so apologies for the unsubstantiated claim) This, I’ll argue later, is a bit of a detriment to the Valiant’s playstyle. Ok, let’s be honest here. Kuki has been a Lucio player in professional play for all of 1 month. That said, his stats like healing/10 (5533) and damage/10 (3690) as Lucio are not bad. They’re very much comparable to mid-tier teams’ Lucios (like Jecse, BigGoose, Closer), though on average about 1000 short of top teams’ Lucios like Anamo and Slime. These statistics do not seem like that of somebody bringing the whole team down. However, there is a notable point in Kuki’s stats. Kuki holds his ult (after fully charging it) for an average of 43.33 seconds. Let’s put that in perspective: The league average is 31.6, with BigGoose having a whopping 17.9s average hold time. Valiant has an average team fight length of 15.9 seconds. That means that Kuki is holding his ult in for 2.7 teamfights on average. Admittedly, that could be down to him waiting for the exact, perfect opportune moment to use his ultimate. But if that were the case, his ult usage should be ridiculously effective, and Valiant should be winning every fight he uses sound barrier in. This isn’t the case. In fact, it’s the exact opposite of the case. Valiant has won 45.11% of the fights Kuki has participated in, but have only won 36.11% of the fights Kuki used his ultimate in. That means that Valiant’s win percentage is 9% less when Kuki uses his ultimate. But jokes aside, this is symptomatic of a bigger problem. This indicates either (i) Valiant are failing to follow up, or over-committing when beat is dropped, (ii) Kuki is ulting at the absolute wrong time, or (iii) Kuki is ulting in lost fights. Either way, this isn’t a stat line you want to see with regard to a powerful defensive ult like Sound Barrier, which can completely swing a fight. Not using the ult to its full potential severely disadvantages the Valiant, and could very well be what is costing them these close games. Yes, you want the dark green to be higher than the light green. Before we get some “NO CUSTA NO WIN” spam, I do feel like it’s worth doing a bit of a comparison between both players. Custa does in fact lead Kuki on both healing and damage per 10 minutes (with over an hour played, so we’re not drawing from a ridiculously small sample size), with 5852 healing/10 minutes (relatively comparable), and significantly more damage (4927/10 mins). Perhaps more notable is that Custa only holds ult on average for 26.17 seconds (far below league average, and only about 1.6 teamfights). Speaking to the timing of his barriers, Valiant wins fights with Custa 46.6% of the time (and 47.62% of the fights where Custa uses his ult). Custa’s percentage of fight wins when he uses ult is 1% higher than fight wins without ult. This suggests his ult usage is significantly more appropriate, and might actually help win fights they would have otherwise lost. (Of course, Custa isn’t some Lucio ult prodigy or anything, some Lucios like Neptuno or Masaa boast a 13% higher win rate when their ults are used), but 1% seems to be an upgrade over -9%. My personal hypothesis for this phenomenon is communication. Sound barrier is useful when you want to keep fighting, but you don’t have the health pool to do so. Or if the enemy is about to burst your team down and you need to react defensively. This is all information your teammates can provide you as a Lucio, and informing your team when you want to drop the beat so they can respond in the appropriate way will ensure your barrier is put to good use. Kuki’s ineffectiveness with his sound barriers compared to Custa suggest Custa may be better and receiving and giving the information that is essential to a perfect beat. Custa’s stats don’t tell us of a perfect Lucio, and truth be told, putting Custa in isn’t going to magically fix all of Valiant’s problems. But these numbers suggest to me that Custa might be an upgrade in terms of ultimate usage and communication, which are crucial in a meta like GOATS. So maybe not a “NO CUSTA NO WIN” spam, but more of a “NO CUSTA and it’s significantly harder to clutch out a win due to their inability to use sound barrier in an appropriate manner to swing fights, causing an increased likelihood of NO WIN”. Though I’ll admit that’s less catchy. This is where I get a little more wary in my assertions, because Zarya play is difficult to quantify, especially with the very limited statistics I have access to. Given that I don’t have stats like bubble use frequency, amount of energy gained per bubble, or even average number of people caught per grav (the official OWL site stats do leave much to be desired, and these stats are understandably also not available on Winston’s Lab), crucial parts of Zarya’s kit are left unaccounted for. But without those statistics, Kariv looks like an above average Zarya. He’s in the upper half of Zarya damage per 10 minutes, lower half of first deaths in a team fight, and given his apparent ult ineffectiveness, you might expect something like what we saw with Kuki (low fight win rates in fights where Kariv uses ult), but he’s flat out average in that stat as well. By all accounts, these stats do not make it look like he’s the Zarya player of the only winless team. But how do we explain the fact that he is? You have to imagine Fate might be thinking this. He was rated one of the top main tanks coming into Season 2, and was picked to represent South Korea (and won) at the World Cup last year. And here he is, on the 0–7 Valiant. A team with a top rated Main Tank and possibly the best Western Off Tank shouldn’t be struggling in a tank-heavy meta… right? What’s changed since last season? Thinking about it, I thought about this brief statement Ark made at the World Cup Group Stage a few months back. He mentions why South Korea chose to run Fate on Wrecking Ball over Winston. Also important from this video, Ark saying “I can’t carry everyone”. Can you carry Valiant? Please? Their Zen player, though looking pretty good, is new to the stage. I didn’t mention Izayaki much earlier, but remember Kuki’s ult use causing fight win rate to fall 9%? Izayaki’s ult usage results in a 7% lower fight win rate too, suggesting Transcendence isn’t being used appropriately either. This all suggests that Fate is no longer receiving the same amount of support he is used to, and his aggression can no longer be sustained. Fate’s Reinhardt dies first about 19% of the fights he’s in, and his Winston dies first about 23% of the fights. While par for the course in GOATS (the main tank is the primary target to burst down first in the composition), Fate has one of the highest of these numbers for both Rein and Winston, dying first more than any average main tank. This suggests the team is not protecting the key target you ought to be protecting in GOATS — your main tank. However, what is alarming is that if Valiant loses a player first, they only win the fight 7.2% of the time (This is a dismal number, only beaten by the Justice and Defiant). I’d argue that we can’t just credit this to Fate dying first, since Justice and Defiant actually have pretty low Rein first death percentages, but are still losing out, and while Fate’s first death numbers are high, they’re not the highest, or significantly higher than the next main tank. Rather, it seems like if any one person dies, there is no longer enough sustain to keep the team up in a 5v6. Fate’s high first death rate seem to be symptomatic of a deeper issue with aggression and protecting key players in the composition, and when one person goes down (regardless of who it is, since 60% of the time it isn’t Fate), there just isn’t enough support to sustain their aggression and they crumble most of the time. This has turned the Valiant into a team that once excelled in overtime, to one of the least clutch teams who can’t turn a 5v6 in their favor. A team is more than a sum of its parts, especially in GOATS. Teamwork can make or break a team, regardless of how mechanically skilled individual players are. We can go on all day about how each player isn’t playing up to their potential, but at the end of the day it comes down to how the team works together. Keeping the main tank up is not just Fate’s job, but it’s the job of Space’s Defense Matrix, Kariv’s bubbles, Agilities’ Armor Pack, and the supports’ defensive ults. Getting team-wiping bombs isn’t just Space’s job, it’s the job of Kariv’s grav, Fate charging the Rein away or Agilities stunning him, a perfect Lucio boop from Kuki, or the right discord from Izayaki. Capitalizing on defensive ults isn’t just on the supports either, it’s on the whole team to understand when to be aggressive and when to retreat. Overall, what’s wrong with the Valiant can’t just be pinned down to one player, or even one coach. There are a couple of identifiable (and fixable) issues, and a couple more complicated ones, but understanding and quantifying them might be the first steps to going 1–7. This hasn’t been a finger pointing exercise — far from it. I know I focused on a few more players and less on some others (is my Space bias showing? ), but my focus was more on quantifying the typical points of contention within the community, as well as pointing out interesting stat lines. If I left something out, chances are it may not have had a very interesting implication or conclusion (to me, but what do I know?). On many accounts, these players are matching their peers, and it’s showing in their close scores and comparable stats for damage, healing and eliminations. But as a fan of the team, it hurts to see them on the cusp of winning over and over, and not being able to close out a game. With a few weeks before their next game, I really hope to see the arena in green again as it says “LOS ANGELES WINS” at the end of a series. There’s very clear potential on this team, and I have faith they can finally realize it. Or maybe GOATS will be dead and all this talk will be for nothing. A girl can dream. All stats were retrieved from Winston’s Lab and the Overwatch League Website at the end of Stage 1 Week 4, and only players with over an hour of playtime were considered in averages.